The Paeonians were an Illyrian tribe who in Antiquity were found along the upper valley of the river Axios (Vardar) all away into the river Struma in the east (current western Bulgaria). Their region was positioned in between the lands of the Dardanians and the ancient Macedonians. In the northwest Paeonia bordered the lowland of Pelagonia; in the north, the Illyrian tribes of the Dardanians and the Autariatae bordered them. In the east and southeast of Paeonia, Thracians were the ones that were most commonly found. In the south, the kingdom of Macedon was located. 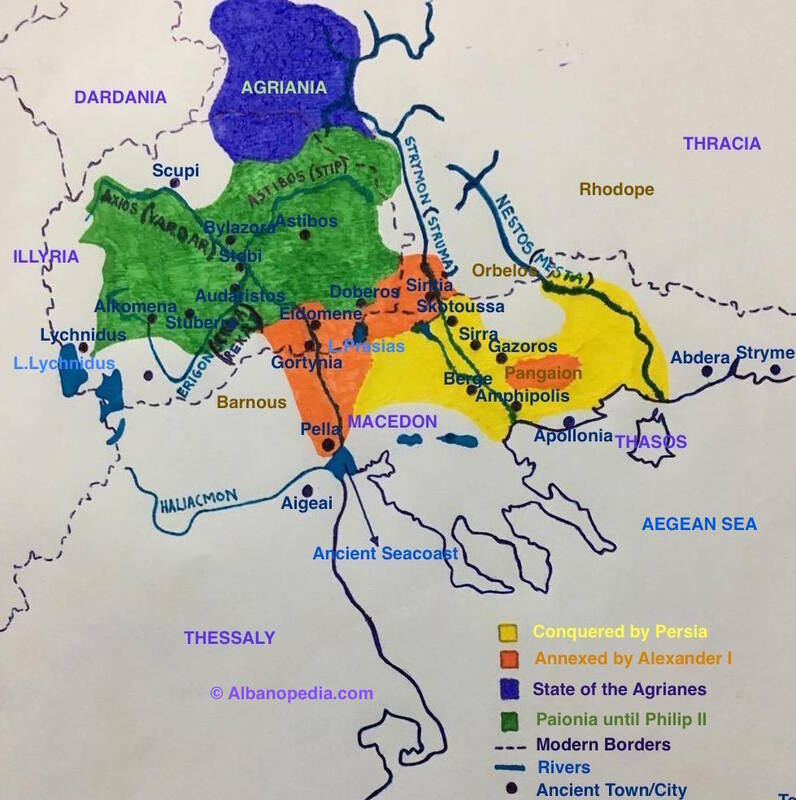 Domestically, apart from the Paeonians, Paeonia was composed of various generally Illyrian tribes such as the Agrianes, Laeaeans, Odomantes, Paeoplae, Almopians, Doberes, and Siropaiones. The lands of Paeonia correspond in large parts with the current lands of the FYR Macedonia. It should also be noted that Paeonia should not be confused with Pannonia (a Roman province near the Danube River). The Paeonians are first mentioned in the epic work “Iliad” attributed to Homer. In that poem, the Paeonian tribe is listed among the allies of the Trojans in the Trojan War (c. 1180 B.C.E.). The Paeonians founded their own kingdom sometime during the first half of the IV century B.C.E. According to Polybius, the most important city of Paeonia was Bylazora (near Knezhje in modern FYR Macedonia). This city was positioned along the main road that leaded into Pelagonia through the valley of Babuna and Raec, thus connecting Macedon with Dardania. As a result of its strategic position, Bylazora was the target of both the Dardanians and the Macedonians. For the side that controlled the city, it meant holding a secure bridgehead into the lands of the other rival. In fact, the whole region of Paeonia was often turned into a buffer zone situated between the stronger states of Dardania and Macedon. It was in Paeonia where the Macedonians and Dardanians often clashed with one another. It appears that Bylazora itself soon fell into the hands of the Dardanians until in 217 B.C.E. 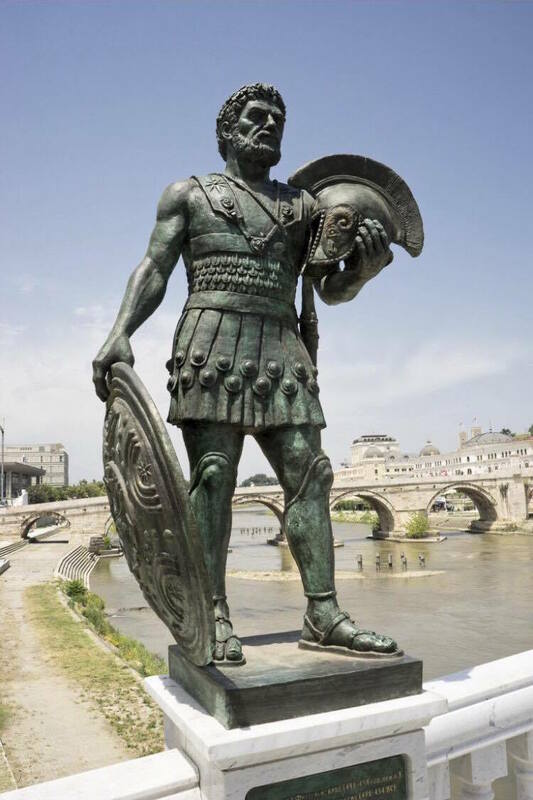 was conquered by Philip V of Macedon (r. 221-179). As a result of the Dardanian conquest, the capital of the Paeonian kingdom moved further south into Stobi (Gradsko). Megabazus, a Persian general, was appointed by Darius to control the Persian conquest in Europe. Herodotus states that the general conquered first the Perinthians who inhabited the area around the Hellespont. After the victory over the Perinthians, Megabazus was ordered directly by Darius (who at the time resided in Sardis) to advance further west, into Paeonia. The plan of the Persian ruler consisted in opening a clear way into Macedon by forcefully relocating some of the Paeonians who blocked this way and replacing them with other more friendly Thracian tribes. Upon hearing on the march of Megabazus against them, the Paeonian tribes joined forces and prepared a defence near the coastal area (near Philippi) assuming the Persians would assault them there. Megabazus, aware of the prepared defence of the Paeonians, avoided the direct clash near the seacoast by following a different route that passed through the highlands (Gazoros). Thus, the Persians entered eastern Paeonia that was left unprotected from the Paeonian ineffective mobilisation further south. Here, the Persians captured many Paeonian families that he exiled into Asia Minor. Other lands of Paeonia were conquered by Alexander I of Macedon during 498-454 B.C.E. Notably these consisted of the narrow portions along the lower Axios (Vardar) including Pella and the seacoast. These conquests would deny the remaining Paeonians any direct access into the sea. During the same time, the Paeonian lands that had previously been invaded by the Persians, fell under the control of Macedon. Furthermore, during the same century, the Thracian tribes would overrun other portions of Paeonia. These parts that were annexed by the Thracians included the lands around Lake Prasiad as well as those of the Pangaion. These changes would limit the Paeonians into the middle stream of Axios and along the valleys of its rights and left tributaries. It was these area that should be regarded as the political entity of Paeonia including within it important cities such as Prilep (Stuberra), Bylazora (Veles), and Astibos (Štip). This condensed entity would border Macedon on the place called the Iron Gate (Demir Kapija) just north of Gortynia (Gevgelija). On the other hand, the mountains in between Scupi (Skopje) and Bylazora (Prilep) would separate Paeonia from Dardania. These would be the extents of the Paeonian entity during 454-358 B.C.E. The victory of Philip over the Paeonians would allow the Maedonians the annexation of some of their territories, notably the lands around Stobi after 356 B.C.E. The reduction of the Paeonian lands during 512-358 B.C.E. Paeonia returns into the attention of ancient writers by the time Philip II was proclaimed king of Macedon. In the spring of 358 B.C.E., Philip II marched with his army through the mountainous region in the north of Macedon and entered Paeonia. This represented the first campaign of the Macedonian king after he had reformed his army and introduced the “phalanx” among his forces. It seems that the Paeonians did not constitute an immediate threat to Macedon at this time. Their actions were limited in sporadic raids at the northernmost border of Macedon. Thus, it can be argued that king Philip chose to wage a campaign against the Paeonians in order to further solidify and improve the capabilities of his army and test in an open battle the formations of his newly Macedonian phalanx “invention”. The Paeonians, now weaker than other neighboring states, would provide a descent “sparing partner” for the Macedonians. Although in a declining stage, the Paeonians still preserved their military tradition. The Paeonian army was composed mainly of peltasts and javelin-armed light cavalry, similar to the military units used by tribes of western Thrace. Regarding the total number of troops that Paeonia could mobilize, we have no direct evidence on the figure. However, it is still possible to make assumptions on the number of Paeonian soldiers by counting on the reports that describe their participation in the ranks of Alexander’s the Great army. Accordingly, when the Macedonian forces of Alexander gathered in Egypt, about 600-650 Paeonian cavalrymen were present (presumably half of their total cavalry). Another 600 Paeonian horsemen joined later the main army of Alexander in Syria. Thus, it can be assumed that about 1,200 Paeonian cavalrymen were eligible for combat across all Paeonia in instances of mass mobilization. The campaign of Philip against them must have been one such instance and most of the 1,200 Paeonian cavalrymen must have showed up to face the Macedonian army. As for the number of Paeonian foot soldiers that the Paeonian deployed against Philip, Ray suggests that it consisted of about 5,000 soldiers. Philip, in charge of a superior army, entered Paeonia in need of an open fight. From a tactical standpoint, the Paeonians had no reason to openly face Philip’s forces. They could have well chosen to avoid the clash until the Macedonians would eventually retreat and return into Macedon. Instead, the Paeonians chose to fight apparently evaluating the situation from a strategic standpoint. Other reasons for this decision may be related with a cultural tendency of not avoiding a fight. Another influencer may have been the Paeonian king himself. Just recently declared king, the new Paeonian ruler may have been eager to prove his leadership skills in an open battle. In case of victory, he would secure his authority across the country. Ultimately, the Paeonians may have decided to confront Philip’s forces because they simply thought they could win. At the time, the forces of Philip had not yet acquired the favorable reputation they were to gain in the upcoming years. While the Macedonians had a higher number of foot soldiers deployed, the Paeonians could count on their seemingly superior cavalry. If Paeonian horsemen could overcome the Macedonian cavalry at the flanks, they could come into the help of their infantry against the phalanx in the center. If such was the reasoning of the Paeonian chieftains, they must have chosen to await the forces of Macedon into an area that gave their cavalry, as an elite unit, a large space to maneuver. It would have also been wise to hold a place with tree-covered uplands near their backline formations in case a covered retreat was required. Upon seeing the Paeonian army waiting for him from a distance, Philip ordered his soldiers to shift from their marching formation into phalanx formation. It can be assumed that the Macedonian phalanx at this time was ten men deep. Philip himself apparently stood on the right side of the army along with his hypaspists and hoplite mercenaries. Cavalry units were positioned on both wings. Meanwhile, the Paeonian army was positioned in a similar fashion. The core part of their infantry, composed of approximately 4,000 soldiers, stood in the centre to face the phalanx while the cavalry was deployed on the flanks.